If you want to install artificial turf in Hertfordshire, we always recommend looking at the different types of artificial Turf available. By doing this, you will be able to get a good idea of what the differences are between natural grass and artificial turf . Here at Perfect Artificial Lawns we are able to source you samples so you can literally get a feel of how life like Artificial Grass is. Many homes in the UK already have artificial lawns installed that look so authentic, you could be walking right past them without ever knowing. You will be able to find samples of artificial turf on our products page. 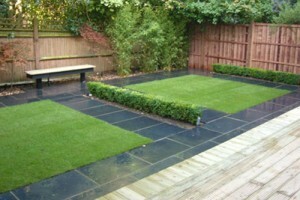 Simply select the artificial turf you would like a sample of and fill out our order form. You can choose more than one sample to help inform your decision and your samples will be posted out to you within 48 hours. Although there is a lot of information on the Internet, nothing quite replaces the experience of actually seeing it up close and touching it with your hands. Our high quality samples will help you to choose the best artificial turf for you by giving you a quick idea of what you can expect to install on your lawn. As you look through the different turf options, take note of all the variations that you come across. There will be differences in the feel, texture, look and length. You should also pay attention to the grass play density. The denser the grass blades are, the richer your lawn will look. You should always pay attention to the drainage holes of the artificial turf. They will typically have holes that allow water to run through them. This prevents water from puddling on top of your lawn. The specific backing pattern that you should look for will depend on the size and area that you are going to use the artificial turf. If you are using it for indoor purposes, you will not need to look for a drainage turf backing at all. If you are unsure what to look for specifically, you can get our reliable services by making call on 0845 548 0055. Our friendly staff will be happy to help in any way they can. There are many options to consider when you are selecting the right artificial turf. We recommend speaking with us so that we can help you determine what artificial turf is perfect for your lawn. Visit Our Products Page Now!